Create a product or service to sell online. Analyse the data returned from various web usage analysis programs over a period of time and a pattern begins to emerge. People continually request information on the following types of products/ services on the web. The convention on the web is that creating your own product or service to sell online is your fastest path to success. AND... if you closely examine anyone who's a success online there's a constant pattern. Those at the top of the food chain are all selling their own products and/ or services. Find Out What People Want - Give It To Them ! R.. E.. S.. E.. A.. R.. C.. H .. - I.. T.. The WHO and the WHAT go hand in hand. Find one and you'll find the other. What you're interested in finding out is the demand/ supply equation. system then research is a cinch. Basically all you'd do is run your SBI Manager software with some of your product *idea* keywords. Less than two hours later you'd have a list of keywords related to that product *idea* and a breakdown of their demand/supply and profitability. Pick the one you like and go create (or find) a product using that keyword. JimTOOLS-KeyWordWizard: JimTOOLS is a wonderful collection of various analysis programs to help you A N A L Y Z E stuff, like keyword usage. Okay, now you've done your research. You've found your in-demand product or service. You now have to create it [your product] in a saleable format. Now, there are literally thousands of product/ service options to choose from, so here we'll only deal with TWO of the highest in-demand products. AND, as space does not allow, rather than tell you what to create we'll tell you HOW to create them. Information products are created in either PDF format and/ or in EXE format. To create your PDF format information product (ebook) you'll need to own a copy of Adobe Acrobat distiller [ADOBE] and know how to format your document in PDF format. It's the definitive work on the subject of creating your own InfoProducts to sell online. Now, this is a huge topic, and not one that can be adequately covered here. However, if development of your own software is something that interests you then there's one resource that does cover this topic in great detail SOFTWARE Secrets Exposed. Now, for those who want to take the shortest path to their "own" products there are some other options. These options usually involve some system that someone else has set up. You just "rent the space" so to speak. So, it's your choice ... "Top Of The Food Chain" OR... "Sharing The $Take With Another." It can also be a case of Mix-N-Match. It's your choice. These above are some of the critical aspects of creating a product or service to sell online. HOWEVER... it is just not possible to analyse and list every possible alternative here, as every day more are being developed. 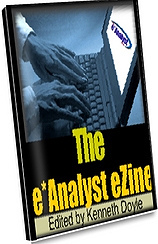 All new, valuable developments discovered will be discussed in-depth in The e*Analyst ezine.